Key witness: Scapegoat, Izzydeen Atik. A seventh man has been convicted in the Victorian Supreme Court, while his co-accused are facing further charges. He was sentenced last year to five-and-a-half years jail with a non-parole period of four years. The jury yesterday convicted a seventh man of being a member of the cell, but was unable to reach a verdict on his co-accused, 31-year-old Shane Kent, who is now facing a re-trial. Those found guilty will appeal against their convictions, while four of the men are facing further charges. They are accused of ordering laboratory equipment to make explosives and will face trial at a later date. "That was one of the bases of the application for the jury to be discharged that the first law officer of this state is making comments on the trial whilst the jury was about to deliver its verdict," he said. Lawyer Greg Barns, whose client Ezzit Raad was found guilty yesterday of making funds available to and being a member of a terrorist organisation, says the anti-terrorism laws are misguided. "Well the laws are too wide," he said. "They have to be curtailed so that they deal with the root evil which is trying to be dealt with, that is, terrorism, not simply to sweep up everyone in its wake. "Guilt by association is becoming part of our criminal law and that has been anathema up til now in our criminal justice system. "Their reach is quite wide. We're going to see cases where freedom of speech will be impinged." They have to have it. This rubbish legitimises their war on terror. That we need to be protected. More information about how the key witness came into play would be vital to understanding how he became an informer. Was he offered 5 with a 4 instead of 20 years jail if he became a key witness? Did they tell him they would make it stick? Was he of sound mind? A Supreme Court judge has criticised federal Attorney-General Robert McClelland for commenting on Australia's biggest terrorism trial before it was finished. Justice Bernard Bongiorno said it was "abundantly clear" the justice system was ill served by comments Mr McClelland made on Monday after 24 of the 27 verdicts had been delivered. When a defence lawyer suggested Mr McClelland should have waited until all the verdicts had been rendered, Justice Bongiorno said flatly, "It's very hard to shut them up." Justice Bongiorno's main criticism came in a ruling yesterday that, while the comments "had the potential to upset the trial", the jurors should continue their deliberations as they had been frequently warned about outside influences. The jury remained split on the fate of Shane Kent, who will face a retrial. Altogether there were 16 guilty and 10 not guilty verdicts. The jury was hung on one count after seven months. Outside court, lawyer Rob Stary also criticised Mr McClelland for his comments and for supporting the laws rushed in by the Howard government in 2005, under which eight men have now been convicted. "It beggars belief that the Commonwealth Attorney-General could make comment while the jury was still deliberating," Mr Stary said. "What the real question is in this case is how four innocent men could have been kept in Guantanamo Bay conditions for almost three years." He said the Federal Government should not tolerate the failure of the Australian Federal Police, and Commissioner Mick Keelty, after spending $20 billion chasing "so-called terrorist prosecutions". "We have spent $20 billion in this country in pursuing cases against inconsequential figures," he said. "You will remember in this case in 2005, when these men were arrested, they said that an imminent terrorist attack had been thwarted. Well, unfortunately they could not identify any imminent terrorist attack by these 12 men: four of them, of course, have been found not guilty." The Senate was recalled to change a word in the legislation under which the men were tried, leading Mr Stary to call the prosecutions political. The final verdicts came on the 22nd day of deliberation after a 115-day trial, the largest and longest of its kind in Australian history. 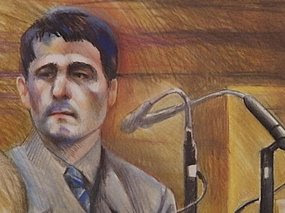 In discharging the jury, Justice Bongiorno thanked the nine women and three men "a sterling task, a very difficult task", performed over seven months. Haddara was found guilty of being a member of the organisation but cleared of the lesser charge of possessing a computer used in preparation for a terrorist act. Haddara joins Benbrika, 48, Abdullah Merhi, 23, Aimen Joud, 23, Ahmed Raad, 25, Fadl Sayadi, 28, and Ezzit Raad, 26, in custody awaiting sentence. Hany Taha, Shoue Hammoud, Bassam Raad and Majed Raad walked free on Monday after being acquitted of all charges.